I have a large desk – I need a large desk – actually, I really do. None of that minimalist, tidy all your tat away each and every day for me. I like to look at things that remind me of loved ones and some of the places I’ve visited. So no matter how bad the day is going I have a little bit of happiness with me each and every day. You can see from this image that I have a snow globe and a crystal ball to hand as well as a small, leather-bound notebook, and post it notes with lists, lists and more lists. 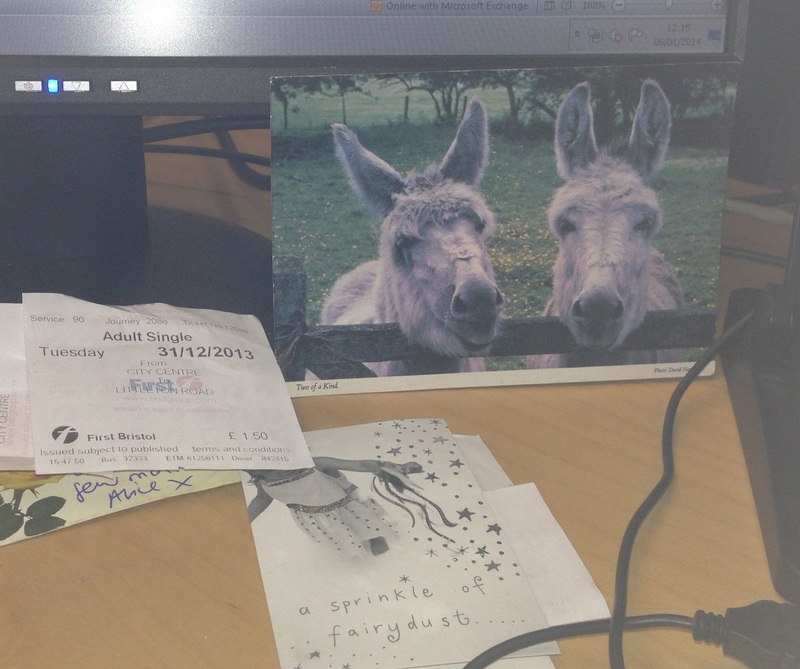 This is a small part of my desk – I also have a thank you note, a note from my Mum, books, business cards, and a picture of donkeys. I like donkeys, they make me smile. And in a world where stress is ever present you need to be surrounded by things that make you smile. Oh, and a laptop, keyboard, monitor, network hub, chargers and all sorts of other business-like paraphernalia too. I like clutter, I like to have a lot of things to look at. It stimulates and comforts me. It also grounds me on the days where I feel the better option is to launch myself out of the 11th floor window just to see if my cape gives me super hero powers. Health, happiness and donkey smiles to one and all for 2014. ← Why drinking with your hairdresser is good for you.